097/365 nexusoftheuniverse, originally uploaded by ajbrusteinthreesixfive. I have seen every episode of Seinfeld at least 10 times each. 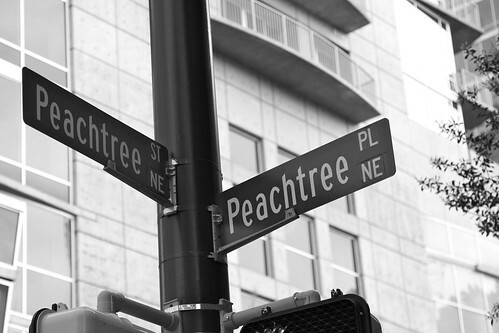 One of my favorite lines is when Kramer gets lost in NYC and tells Jerry he is at the “Nexus of the Universe” when he looks at the street sign and it is 1st St and 1st Ave. Well, here in Atlanta, every other street is named Peachtree something (well 71 of them at least), including the main street running north-south through the city. I have driven past this sign many a time and never taken its picture, but decided today was the day. And since the light was no good and the color unimpressive, decided to turn it into b/w.